You can decide if a steel roof is right for you by answering a few simple questions, and you'll learn some valuable information in the process. Learn more about Is a steel roof right for me?. Can you walk on a Steel Roof? What is the minimum roof pitch? How much do they cost compared with other roofing materials? Get the facts about steel roofing on our frequently asked questions page. Learn more about FAQ’s. Learn more about the beauty, durability, and energy efficiency of of a steel roof, and a few unexpected benefits regarding weight, coatings, and wind, hail, and fire resistance. Learn more about Steel Roofing Benefits. When it’s time to replace the roof on your existing home, or it’s time to choose a roof for new construction, it’s time to think about the impact of your roofing decision on your future energy use. Don’t miss this opportunity to avoid costly rework or expensive energy. Every Roofing Decision Affects Your Future Energy... ( read more ) Learn more about Metal Roofing and Solar Energy Systems. Find out what to do immediately after a hailstorm, what to look for in a contractor, and the UL 2218 Class IV Impact Resistance rating & how it affects insurance policies. Learn more about Your Roof and Hail. If you’re researching a metal roof for your home, at some point you’re bound to wonder what would be the cost of a good metal roof. In this article, we will share metal roofing prices that you can expect. 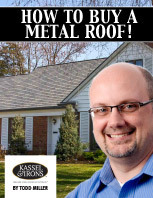 Learn more about Metal Roofing Prices.